Living in Arizona heat can take toll on any individual, no matter how used to it you are. When dealing with the sweltering heat, there’s nothing like retreating back home and being able to relax in your own pool. Unfortunately, not every home in Gilbert, Arizona has a working pool, or even one at all! Think about all the fun activities you can do with you and your family if your home had an accommodating pool. On top of that, having a newly renovated backyard can bring more guests to your home and make it the life of the party! That’s where pool builders in Gilbert come in. If you’re in the market for a pool, looking to remodel your old one, or do a number of other backyard-related work, then you should look no further. 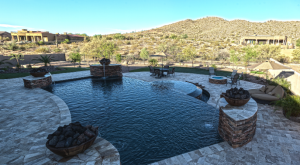 Let’s explore the many different options provided by pool builders in Gilbert, and see what option can work best for you. 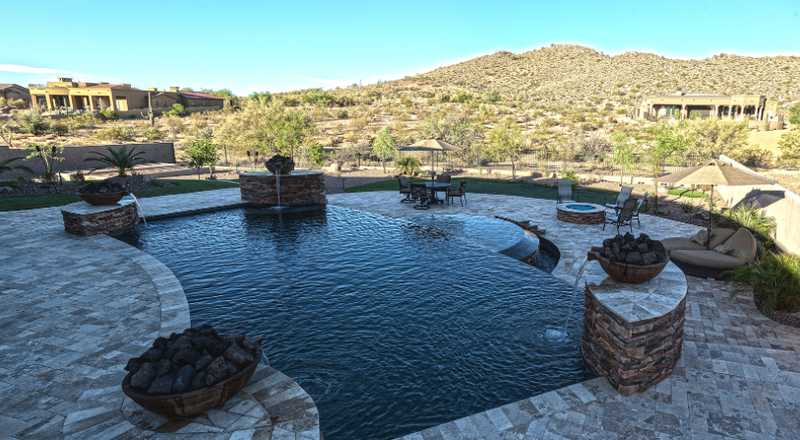 A team of pool builders in Gilbert will help you transform your dreams into a reality! The amount of options are endless, but a pool builder will sit you down and walk you step-by-step through the process. You will choose things such as the material used for the pool shape, the water features that you want installed, and what the purpose of your pool will be. There are three types of swimming pool materials that pool builders in Gilbert will discuss with you. They are fiberglass, concrete/gunite, and vinyl liner. Let’s explore the pros and cons of each. Water features are a great addition to any pool, and can provide endless amounts of fun for guests and children alike. A pool builder in Gilbert will go over the idea of installing water features such as waterfalls, slides, diving boards, and even spa additions. Slides and waterfalls may be great for entertaining children, but if your kids moved out, and you’re looking for more of a relaxing vibe, than a spa addition may be the right move. Lastly, a pool builder in Gilbert will ask you what you are looking to use your pool for. This is probably the most important question that will be asked to you, as it will shape a number of other decisions. For example, if your pool is going to used more for your children, then you may want the pool to be shallow, contain a lot of fun water features, and be accessible in case of any emergencies. On the other hand, if you’re into fitness, then you’ll probably want a long and narrow pool for swimming laps and not many distractions. The options are endless and are ultimately up to you. Investing in a pool can be quite a task, especially if you’re unsure of what to do next. Therefore, make sure that you contact a pool builder in Gilbert in order to make sure you get things done right, and within your budget. Don’t suffer from the Arizona heat any longer. Create the backyard environment of your dreams!